Greektown business owners say they are feeling the shaky economies in both the U.S. and Greece as hardships from their loved ones overseas remind them of their own struggles here in Chicago. Many are skeptical whether next months G8 summit will address solutions to both countries’ economic crises. Sprawled over a mile near the West Side, Greektown has become an epicenter of local shops, businesses, and restaurants, many owned by Chicagoans with strong ties to Greece. Unlike Liakouras, his one brother and two sisters were not able to migrate to the U.S. in the late 1960s due to financial constraints. Liakouras shared that him and his siblings were forced to choose between staying in Greece to take care of their parents or flee to the U.S. They had no idea Greece’s economy would decline and cause more financial turmoil. Liakouras took out a loan last year in order for The Parthenon restaurant to “get by without trouble,” which he calls a luxury for “living in America,” unlike many of his friends and family in Greece. “[The European Union] already bailed Greece out, but they charged them so much interest that they owe more than what was they previously owed … it just doesn’t make sense.” Liakouras said, shaking his head. Greece received its first loan from the European Union in 2010. According to BBC News, the loan was to recover much of the countries overspending since it joined the euro. Now in 2012, Greece has found itself in need of another bailout, exchanging $173 billion of its $485 billion debt for loans at a low rate of interest in order to keep it from defaulting. “The European Union has [loaned] them so much money,” said Dr. Patricia Werhane, director of DePaul University’s Institute for Business and Professional Ethics. Werhane believes Greece’s economy has become “too dependent” on the European Union and the United States, a mistake that could enable the countries resiliency in the future. Joe Collado, co-owner of Greektown restaurant Rodity's, said he hears a lot of his regular customers talk about their relatives in Greece. 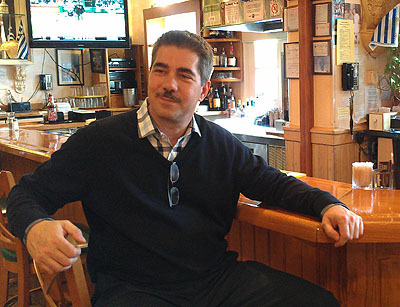 Yiannis Morikis, owner of Greektown Music, had to rebuild his family’s 20-year business after a fire caused damage to his entire shop in February 2010. He said he’s lucky to have been able to “start over” unlike some of his relatives in Athens. While unsure of his store’s financial future, Morikis and his wife, whom is his “one and only other employee,” are doing “OK” in light of the United State’s dire economy. Nia Tsamis is an employee of Elea Mediterranean Food Market, which is owned by her father. She said Elea’s orders of Greek produce is good for the country’s interests as well. Aware of his customer’s strong ties to Greece, Collado acknowledges Rodity’s circumstantial advances due to Greece’s hardships. 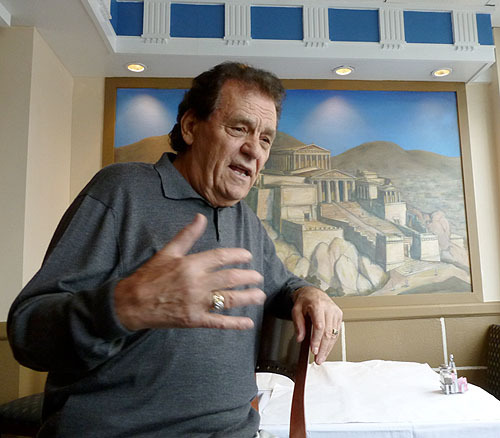 Many Greektown businesses are caught between Greece and the U.S.’s economic dilemma. Werhane said it’s an unfortunate predicament they face while their home country slips into further debt. The world’s economic status will be available for a greater dialogue, as leaders for the G8 summit will gather May 18-19 at Camp David to discuss the debt crisis, particularly in the European Union. Werhane said one of the top concern’s discussed in the summit will be the economic crisis in Greece and whether or not the country can sustain on it’s own without intervention from the United States or the European Union. If Greece were to “go off the euro,” the initial change will be “extremely difficult,” Werhane said. But she added that the long-term scenario might end in Greece’s overall favor. Developed in 1975, the summit originally consisted of six governments: Japan, France, Germany, Italy, the United Kingdom, and the United States thus called the Group of Six or G6. Canada joined a year later and Russia completed the organization and became the G8 in 1997. 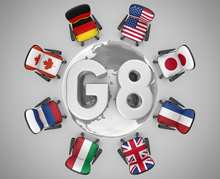 Often criticized for not having a clear “agenda,” with no official spokesperson or offices for its members, the annual G8 summits, according to Werhane, have no official “power” as a group. “Unless they decide as a group to do something … The G8 is really an economic liaison,” she said. Despite the G8 summit and U.S. Presidential candidates promising an increase in job stability, Greektown business owners interviewed say they won’t hold their breath for drastic changes in both countries’ economies. G8 summit: A glimmer of hope for Greece?